Look for teammates who are willing to push back and motivate you. 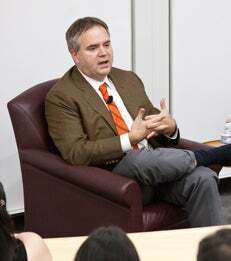 Robin Hayes, current President and incoming CEO of JetBlue Airways, joined MBA students and alumni for a 2014-2015 Langone Speaker Series event. Professor Charlie Murphy moderated the discussion, beginning with an interview and followed by an open Q&A session with students. From a very young age, Hayes was fascinated by the mechanics of airplanes and air travel. After receiving his masters in electrical engineering, Hayes began working in the airline industry, where he held a variety of roles over his 25-year career. “You need to take risks in life and my biggest risk, and payoff, was joining JetBlue.” Hayes shared his story, as well as JetBlue’s approach to operations and customer service strategies. He emphasized the company’s heavy investment in culture and underscored that JetBlue looks for employees who share a passion for the industry. Looking forward, Hayes described how he intends to carry on JetBlue’s traditions and heritage when he assumes the role of CEO. When asked about leading a successful company, he stated that it’s important to find people with talents different than your own.